Prien am Chiemsee is the main destination for visitors to the Chiemsee with its prime position on the western shore of the lake. Situated right on the train line between Munich and Salzburg it also can boast great connections to the islands in the lake as well as some of the most extensive tourist infrastructure in the area. The town itself has a population of around 10,000 - hard to believe that it was a tiny village until the middle of the 19th century. However the construction of the railway line and the opening of Herrenchiemsee Castle to the public in the later half of the 1800s meant that it became a popular destination for visitors from Munich and further north. Visitors poured into the village and chaos ensued, despite the availability of buggy rides for the two kilometre distance to the lakeshore. 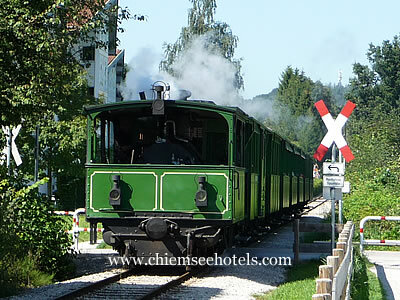 In 1887 the renowned "Chiemsee Bockerl" - the steam train between Prien and its harbour at Stock - was put into service and it remains a popular way of reaching the lake for visitors in the summer months. 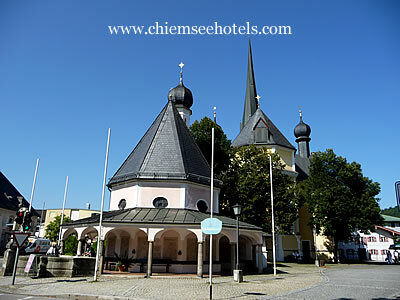 Prien itself is a pleasant small town, with the church of Maria Himmelfahrt forming the main attraction in the central square. Dating from the early 18th century and originally a late Gothic structure it has been rebuilt and remodelled in baroque and rococo styles. The small chapel in front of it is the Arme Seelen Kapelle (Chapel of the Poor Souls), dating from the 16th century but again much rebuilt. There is also a Heimatmuseum (local cultural museum) near the centre and the tourist office. Information about accommodation in Prien and the nearby village of Rimsting can be found on the Prien Hotels page.